Easter Island gets more tourists per capita than Hawai’i. It has more archaeology per square acre than Egypt or Peru. It also has a history of being invaded by foreigners: first slave traders, or “blackbirding” expeditions, in the mid to late 1800s hauled hundreds of islanders off to South America, then the Chileans in 1888, who annexed the tiny Pacific island. The invasion took a different form in the second half of the 20th century, when archaeologists from throughout the world realized the value of this complex, isolated society and came in droves to do research. For decades, they took artifacts from the island, with or without the government’s permission. When the governing body put a stop to that in the 1990s and early 2000s, what left the island became subtler—data and information gathered by foreign researchers for their work, to be shared in papers, books and conferences to advance knowledge worldwide but rarely with the Easter Islanders. That’s not really Britton Shepardson’s style. The anthropology lecturer at Northern Arizona University landed on Easter Island for the first time in 2000, one of many researchers intending to study all the island had to offer. But he didn’t take any artifacts; rather, he hiked all over the island, cataloguing more than 700 prehistoric megalithic statues or moai, documenting and mapping each one and sharing this information online for anyone to access. 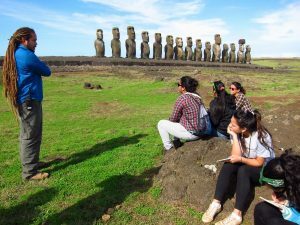 Years before finishing his dissertation, he decided to commit his time on Easter Island to a goal not common in research archaeology: educational outreach for local youth. Shepardson, who has a hydroponic garden made from repurposed tennis ball cans in his NAU office window, recruited Easter Island high school students to help him with his first island-wide project. He’s returned almost every summer for the last two decades to build a nonprofit called the Terevaka Archaeological Outreach (TAO), where he works with local high school students and now more than a dozen NAU students in anthropology, engineering, psychological sciences, mathematics, among others. 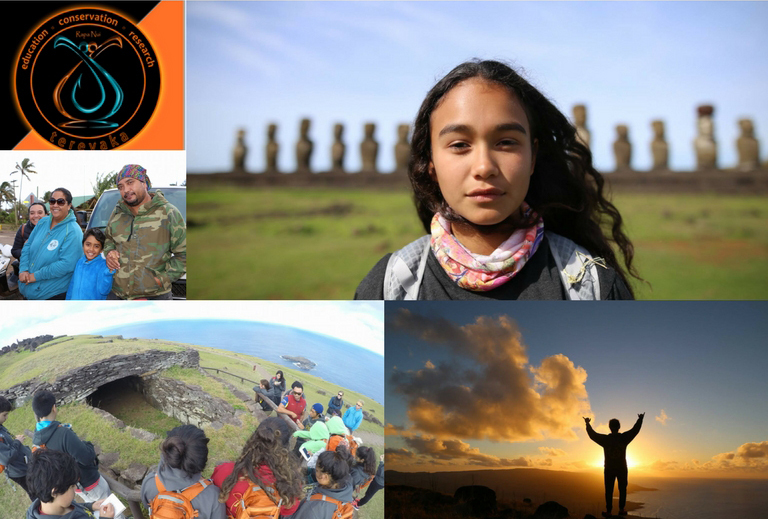 Their work, which in 2017 was funded in part by the College of Social and Behavioral Sciences Research Support award, is documenting, photographing and exploring the history on the island, making it accessible not only to the entire world but also to Easter Island. “What I witnessed in the world of archaeology on Easter Island in my first couple years there was so far from an exchange of equal value from what I saw, between what a gringo archaeologist could get from their time on the island to what the local community would get out of that experience,” he said. “More and more I’ve realized, in a place like Easter Island where probably more than 90 percent of the economy is based on tourism that primarily revolves around archaeology, that my knowledge can be very empowering for the local community. 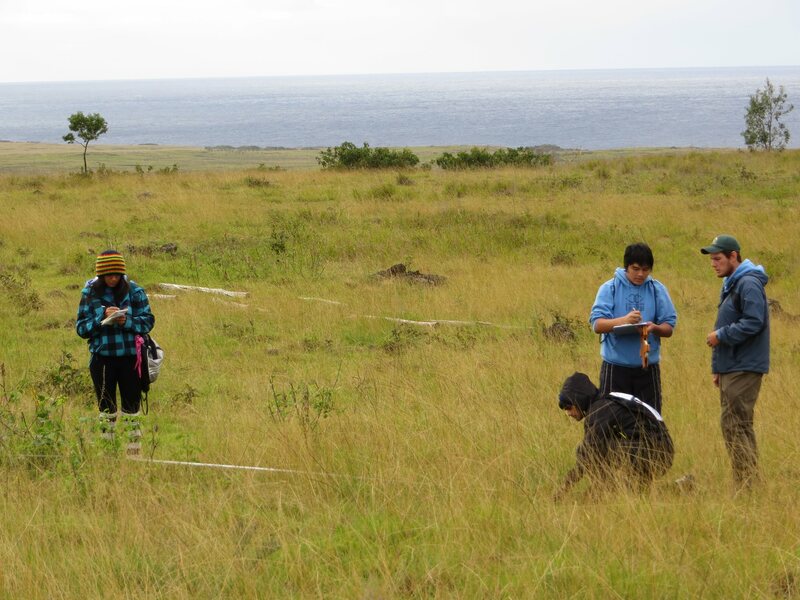 High school students on Easter Island take measurements of a centuries-old artifact. The island—a territory of Chile though culturally Polynesian and home to the Rapa Nui people—is the most isolated, occupied, single island on the planet. The island is 63 square miles in size, most of which is part of Rapa Nui National Park. It has one town, home to about 11,000 people. It might be a sleepy sub-tropical island if not for the airport and seaport in that one little town. A Dreamliner lands every day, delivering people from Santiago, Chile, 2,290 miles away, and Tahiti, 2,629 miles away. Cruise ships regularly anchor off the island’s rugged coastline, flooding the streets and markets with tourists. The town itself belongs to two eras, offering Internet cafes and luxury hotels, by which locals walk barefoot or on horseback. The real treasures, however, were outside the town, in the green fields abutting extinct volcanoes and sandy beaches. Easter Island is home to the moai—hundreds of giant stone statues that seemed to spring forth from the ground. The Rapa Nui were almost entirely wiped out in the late 1800s and early 1900s through a combination of slavery, colonialism and disease, and much of the people’s oral history was lost, so consistent explanations for the meaning and symbolism behind the stone giants can be hard to come by. And, like locals everywhere, the people who live there often are not tourists in their own lands. Most of the knowledge being generated is done by international researchers, but also done with their personal research interests in mind. Shepardson saw a gap—an opportunity that would allow the Rapa Nui to study their own heritage and history and become a part of the legacy that passes it down. 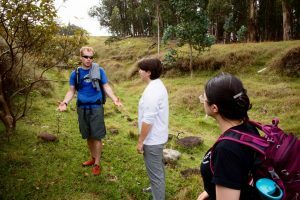 He doesn’t apply for scientific grants, leaving him able to study whatever his Rapa Nui students find interesting, and while he’s on Easter Island he incorporates his students with the locals and the locals with his students at every opportunity, including bringing local experts along on trips. It made for a more impactful learning experience, said junior Angie Sanchez, who is majoring in sociology and anthropology. She went to Easter Island in 2016 and is an author on a paper TAO published about its work. In fact, TAO has created a symbiotic relationship with the Easter Island government: Shepardson is able to bring students every summer, do hands-on work in the museum, access their artifacts and use available resources, while government gets a boost in knowing what artifacts are where and what condition they’re in, access to all of TAO’s research and databases and a growing cohort of students with interest and experience in archaeology, education and the Rapa Nui heritage. It’s not solving all the problems Easter Island is facing after decades of losing items of cultural importance, but it’s helping. 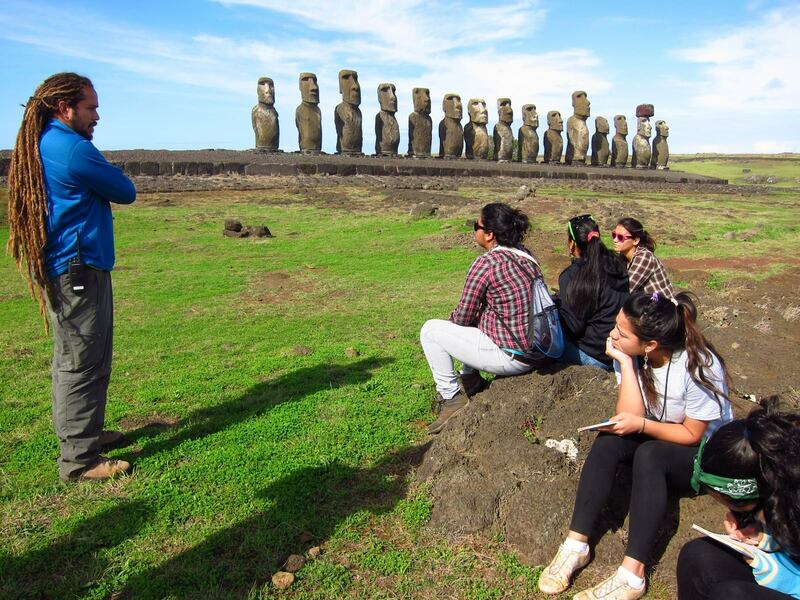 TAO staff member Beno Atan talks to students about the history of the statues on Easter Island. Shepardson knows he’s an interloper. Because of it, he tries hard to give more than he takes from Easter Island—a desire that came about organically as he was hoofing around the island, backpacking from statue to statue working on his dissertation. It starts with his research methods. All his work is non-invasive; he’s not digging anything out of the ground or chiseling material out of rocks. One summer, for example, Shepardson and his team of Easter Island students looked at the growth different lichen species on certain archaeological sites. He realized they could use the growth to get an idea of how long ago people lived in that area. Using digital images, the group determined the growth rate of lichen over time, then measured how much lichen was present, which allowed them to backtrack to how long ago these ancient sites were cleaned or maintained. NAU anthropology lecturer Britton Shepardson (left) talks with TAO participants. He also focuses on the education piece. He’s working with high school students who don’t have any training in archaeology or research methods; many of them have not even been to all the sites they’ll visit with Shepardson despite living on this small island their entire lives. They don’t have special equipment or sterile labs or months to dedicate to a project or funding from an international science organization. What they do have is a director who, well, can make a garden in a window using tennis ball cans. “We didn’t have any equipment, but I found an old theodolite abandoned in the local museum and resurrected it with some tinkering and WD-40,” Shepardson said. “We had local students out there using a theodolite from the 1940s to create a two-dimensional map of where these statue topknots (pukao) are. His latest project, which happens for five weeks in the summer on Easter Island and year-round on campus at NAU, is creating 3-D models of the artifacts in the island’s museum, the Museo Antropológico Padre Sebastián Englert. While the team is down there, they take pictures of each artifact, cataloging the dimensions, coloring and unique features of each. Those pictures come back to Flagstaff, where Shepardson and his students here get a 3-D polymer printing of the artifact in the Maker Lab at Cline Library and then an NAU fine arts student paints the replica so it looks like the original. That piece then returns to the island the next summer to develop the local museum’s first educational replica collection. Magdalena Mery, who is starting her final year of high school on Easter Island, was part of that project last summer. She had friends who participated with TAO and piqued her interest, so she applied. After she finished, Mery suggested that her school restore its manavai, a small garden surrounded by a stone wall, and they did. This program allows high school students to be part of a project that will help to educate their peers and help them get to know their own history. It also has created something of a family. One of Shepardson’s earliest students had a baby a couple of years after she worked with him. Her child is now approaching high school, and she’s set on having a second-generation archaeologist. It provides some perspective for the teacher. 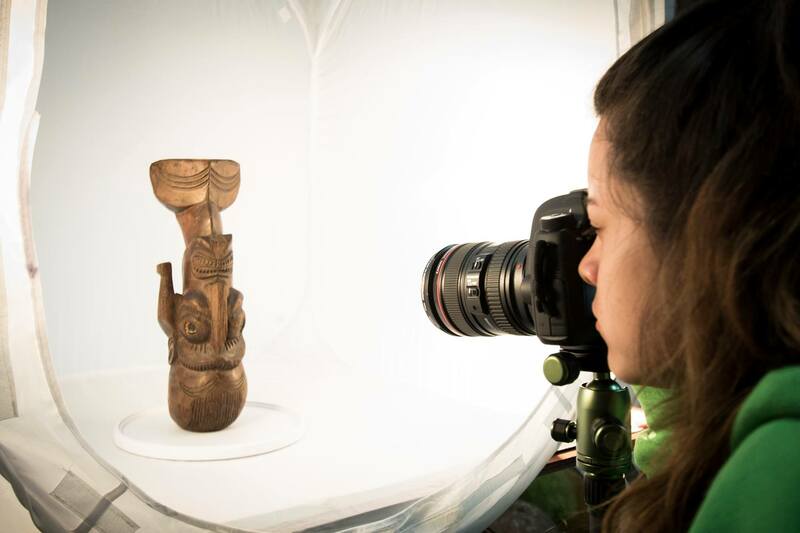 An Easter Island student photographs an artifact to create a digital archive of the Rapa Nui collection. “I think that says a lot, for these alumni to want their kids to have the same experience,” he said. “I’ve seen some of my alums take on what I consider to be really important, persuasive roles on and off the island in education and conservation and archaeology. We’re starting to see students committing to four- or five-year college plans in archaeology and anthropology and returning to TAO events as guest lecturers. There are dozens of questions surrounding Rapa Nui artifacts: Where have they all been taken? Who took them originally? Who has them now? Were they taken with permission? Were they taken with a promise that they’d be returned? Do they belong to museums or to Easter Islanders? Should they be returned? How will that process start? Who’s going to take on such a massive, complicated task? If they are returned, where will they go? Shepardson has many thoughts on the issue of repatriating artifacts, but in terms of action, he’s given himself only one task: make a database of where all of the artifacts are being kept. He’s not calling museum curators and telling them to ship back the statues; he’s not knocking on the doors of Easter Island’s governor telling him he needs to demand the artifacts be returned. He’s not advocating for either side, he and the high school students are simply cataloguing what is out there. Shepardson isn’t getting involved beyond that for two reasons. The first is simple: it’s not his fight. Easter Island as an autonomous community needs to take action if its people decide they want that action. It’s not his place to tell them what to do. The second is he doesn’t know what the right answer is. To bring the question even closer to home, he presents it to the local high schoolers. One of the projects students do each semester is a debate. He assigns a topic, and the students spend half the day at the museum library studying their topics, then they debate. One of his favorites is the fate of Hoa Hakananai’a, a large statue taken from Easter Island that now resides in the British Museum. Should it be returned to Easter Island, he asks the students, or should it stay? He has, however, considered an alternative solution, going back to the sharing of data that is the foundation of his research. By recreating artifacts digitally through photos, video, 3-D photography and even 3-D printing, more people can interact with history and cultural heritage. Learn more about TAO’s work on its Facebook page. 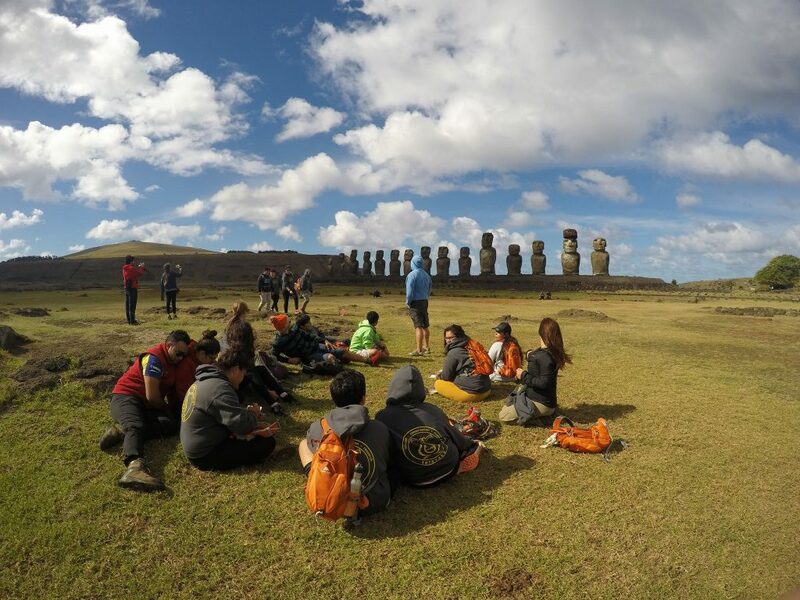 Students interested in participating in a summer study abroad to Easter Island can contact Shepardson or visit TAO’s website for more information. All majors are welcome.